Earrings in Silver 925 (alloy 92,5% pure silver and 7,5% copper) manufactured and designed in Italy with 100% Made in Italy warranty. Our silver earrings are distinguished by precision and elegance, and very convenient prices. 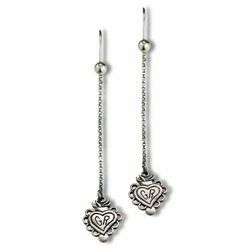 Drop earrings with heart "per Grazia Ricevuta" for Grace Received. Antique 925/°°°silver.